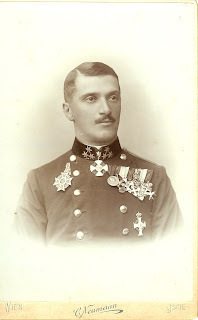 Albert, a first cousin of our grandfather Louis Margutti, served in the court of the Emperor Franz Joseph of Austria-Hungary for about 17 years, and in the court of the Emperor Karl until the Austrian-Hungarian Empire was dissolved at the end of World War I. He became one of Franz Joseph's personal aides. Towards the end of his service, Albert was granted the title of Baron von Margutti. This picture was taken near the beginning of his service, in September 1902, and given to "Tante Laure" (Laura Chartrey). When I was a child, the blue sky above my grandparents' house, at the edge of the southern California desert east of Los Angeles, was my favorite color in the whole world: a bright turquoise, so brilliant it almost hurt to look at it. Every time I think of writing, of putting my thoughts on paper or in electronic format, I remember that sky, and the house where I saw it, where I first began to become a writer.